If winter weather has you itching for sunshine, look no further than Victoria’s Secret for some summery sales. Today is the last day to build a $39 bikini at the popular women’s retailer. Add an eligible bikini top and bottom from the retailer’s bikini bundle selection to your cart. There’s no coupon required for this promotion. 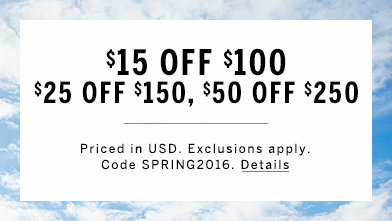 And if you’ll be filling your cart with additional items, consider using promo code SPRING2016 to take $15 off $100, $25 off $150, or $50 off $250. Some exclusions apply, and this coupon expires March 3. Shop smart at Victoria’s Secret with our Victoria’s Secret Store Guide and Victoria’s Secret Semi-Annual Sale Guide.